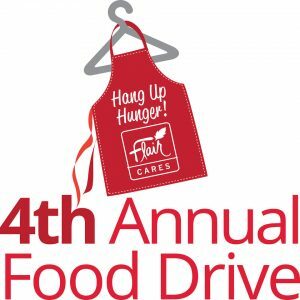 Flair Cleaners will host its fourth annual Flair Cares Food Drive – Hang Up Hunger – February 11 to 28. The drive benefits local food pantries that are facing higher demand due to recent fires and the government shutdown. Flair will match contributions up to 1,000 pounds of food donated by customers at each location. And, in appreciation, every customer who donates will receive a coupon for 50% off dry cleaning. Flair customers and community members may bring unopened, non-perishable commercially prepared, canned or boxed food to any Flair Cleaners location. We do not accept food items that have passed their expiration dates or items in glass jars. For a complete list of recommended food items, visit Flair Cleaners’ Facebook page. Santa Clarita Valley Food Pantry strives to alleviate hunger throughout the Santa Clarita Valley. Their volunteers source donations, pack food, and distribute food to residents in need. Established in 1983, the North Hollywood Interfaith Food Pantry is a 100% volunteer coalition of diverse religious institutions. They work together to address the problem of hunger in the community. Burbank Temporary Aid Center provides the poor, working poor, and homeless with basic services they need to live. Additionally, it serves citizens of the city in times of emergency and disaster.